SnapCacklePop: One Direction get more perfect in new video..! 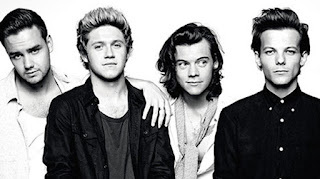 One Direction get more perfect in new video..! One Direction have announced their brand new single Perfect that will serve as the second single to be lifted from their eagerly anticipated fifth album Made In The A.M. and is an emotionally charged love song featuring passionate drumming, rousing guitars, shimmering synths and an immense chorus. The song was produced by Julian Bunetta, Jesse Shatkin and AFTERHRS and written by Harry Styles and Louis Tomlinson alongside Bunetta, Shatkin, Jacob Kasher, John Ryan and Maureen Anne McDonald. The song is reportedly about Harry's ex Taylor Swift, which makes sense after Taylor wrote two tracks about Harry (Style and Out Of The Woods) on her 1989 album. The band have just dropped the new music video for the single and the concept reflects song of the lyrics in the song. The black and white clip shows the boys hanging out in various hotel suites, meeting fans, press, photographers and stylists which is basically how they must live their life daily. Well for now, until they split up, take a break after their world tour. The band recently headlined at the Apple Music Festival at London's famous Roundhouse venue and are currently performing to sold out arenas across the UK and EIRE for their ‘On The Road Again Tour’. Their fifth album MADE IN THE A.M is due for release worldwide on Friday13th November 2015 and is available to pre-order now on iTunes now..!